Generally we arrive at the clients' home between 8:00 and 8:30 AM. We ask our clients to be prepared to not have access to their refrigerator and kitchen cabinets for one day. We mask the floors and walls and create a dust barrier between the work area and the rest of the house. After removal of the old crate and lights, we repair and texture, so that the new lights fit the ceiling area. Next, we install three layers of decorative molding. All nail holes are filled and crevices caulked. We prime and paint the new area using high quality enamel paint. 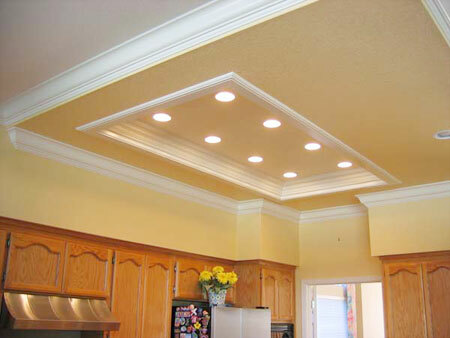 We prefer to use Kelly Moore, semi-gloss Swiss Coffee color paint, but our clients are welcome to provide us with their own paint to match the color of their ceiling. In that case, a $20.00 credit will be given. We will need 1 gallon, since we are using an airless sprayer to apply the paint. Next, we install new lights and the light trim. To meet California Title 24 requirements we recommend high efficacy lights. It will save you money on electric bills and you will do your part in Keeping California Green. Please click here to review additional information about California Title 24. Finally, we remove and dispose of all masking materials and do the final clean-up. For us, every job is a custom job and we treat it as such. We have hundreds of satisfied customers and we know that you will love your new kitchen lights too!